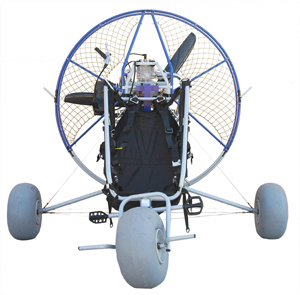 With this trike, it is a joy to take off and land on wheels with virtually any paraglider used for foot launched powered flight. 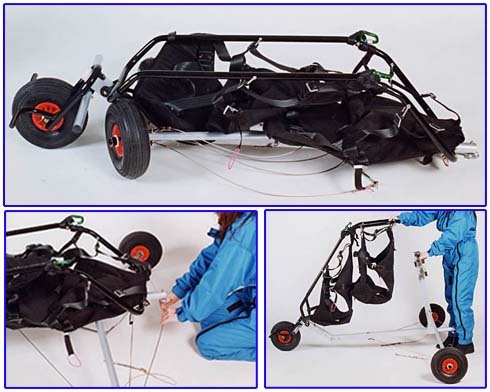 The most distinguishing characteristic of this trike is its fast and simple assembly, allowing you to transport it in almost any car. Although Fly Products' Power Gold is the easiest to use, FLASH can be used with almost any paramotor on the market. FLASH is constructed of two square bars of aluminum with a triangular series of cables and a steel cradle that is used to support pilot and passenger harnesses. The Fly Products Flash Trike allows for extremely quick and easy application of the paramotor onto the trike and the low position offers high stability during take off, while moving on the ground and during landing, even with lateral winds. Another feature that make this trike unique are the FLASH trike harnesses, manufactured specifically for this trike. These harnesses are very light weight, easy to dismount and allow a small storage space. Also, this trike can be fitted with a regular harness if you already have one for free flight. FLASH has been designed for those pilots that would like to make paramotor flying extremely comfortable with the possibility of doing easy and safe tandem flights. The Flash Trike is now available in Deluxe. The Deluxe version has some added improvements, including sand tires made by Wheeleez and pilot foot pedals. The Flash Trike Deluxe can be flown in single or tandem configuration with just the addition of a passenger harness. Width between back wheels: 188 cm. Dismantled length: 170 cm, width: 50 cm.